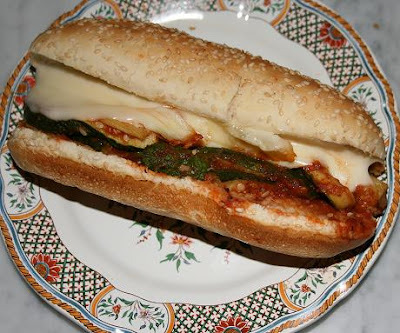 This is a simple, and yummy hot sandwich-a take on a meatball sub. I made this because I had some leftover cooked zucchini. The zucchini was sliced into long strips and fried in a bit of olive oil until just tender. Mix the cooked zucchini with some marinara sauce or pizza sauce. Fill a roll with the zucchini and sauce. Top with some grated mozzarella and some grated parmesan. Wrap the sandwich in foil and bake in a preheated 350F oven until the filling is hot and the cheese is melted, about 15 minutes.